Is spam driving you crazy? 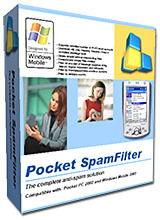 Pocket SpamFilter is the first PocketPC 2002 / Windows Mobile 2003 / SE / WM5 / WM6 application that helps you keep your inbox free of spam. Reduce your bandwidth usage by inspecting your email account before downloading. I love this app because I use a free POP email account on my pda-phone. 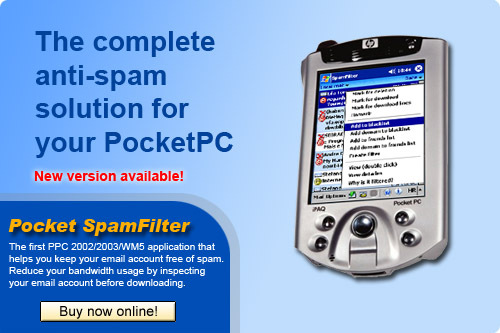 It was so clogged with spam it would not completely download to the pda-phone. Once I loaded this app I was able to take advantage of their pre-set filters and added one of my own. When I run this with my CDMA connection, it wipes out every bit of that pesky spam in a format that allows me to review before deleting. Then I shut this down and download my good email to my Inbox. So easy to figure out and good help menus. New! Pocket Food Additives 1.0 freeware! Also additives that children, asthmatics, vegetarians and people with health problems should avoid.